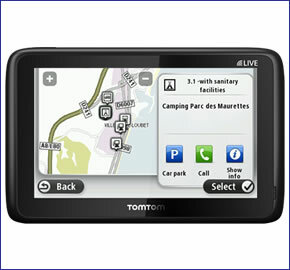 TomTom GO LIVE Camper and Caravan features World-class navigation for across 45 European countries on a 5-inch display. If there is a bridge too low or road too narrow then the TomTom GO LIVE Camper & Caravan helps you adjust routes and arrival times to fit your vehicle dimensions, and special Points of Interest for campers and caravans make finding camping and camper locations easy. TomTom GO LIVE Camper and Caravan includes a FREE 1 year subscription to LIVE services, for the best mobile speed cameras and traffic information. This TomTom Camper device also comes with free maps for lifetime maps and lifetime traffic so you will always be routed around congestion and incidents in the road ahead. The replacement model is the TomTom GO Camper. TomTom GO LIVE Camper and Caravan features World-class navigation for your camper or caravan across 45 European countries. Avoid detours and surprises. A bridge too low. A road too narrow. It’s the last thing you want to come across when you’re driving a camper or caravan. The TomTom GO LIVE Camper & Caravan helps you adjust routes and arrival times to fit your vehicle, and special Points of Interest for campers and caravans make finding camping and camper locations easy. Start driving with the latest map - guaranteed! If a new map for the TomTom GO LIVE Camper and Caravan is available within 90 days of first use, you can download that map once for free via http://business.tomtom.com/getstarted. What is more these maps are free to download for the lifetime of the satnav. World-class navigation for your camper or caravan. Avoid detours and surprises. A bridge too low. A road too narrow. It’s the last thing you want to come across when you’re driving a camper or caravan. The TomTom GO LIVE Camper & Caravan helps you adjust routes and arrival times to fit your vehicle, and special Points of Interest for campers and caravans make finding camping and camper locations easy. Plus, with LIVE Services, you’re updated on traffic and weather, and can find new places easily usingTomTom Places and Local Search with Google. Switch between profiles for campers, caravans and normal cars. Choose the size, weight and speed for your different vehicles. Get the right routes and arrival times whatever you’re driving. It's your choice. Get more options to mount your device in a safe and convenient place, on windscreen or dashboard. Get the most up-to-date, real-time traffic information for your route live on your TomTom GO LIVE Camper and Caravan. Includes detailed incident reports, estimated delay times and alternative route proposals. The TomTom GO LIVE Camper and Caravan receives real-time mobile Speed camera locations, including reports from other users. It also warns you of other alerts, such as fixed safety cameras and average speed checks for the road ahead. It helps you drive safely and relaxed, saving money on speeding fines. Driving with these more fuel-efficient routes saves you money as well as reducing your impact on the environment. The TomTom GO LIVE Camper and Caravan can show you the route which has a lower environmental impact, using the driving data of millions of TomTom users. Use your TomTom GO LIVE Camper and Caravan as an car-kit for your mobile phone. Now you can make and answer phone calls safely while driving, making you in control and in touch. Pinch to zoom in and out of maps, or scroll through menus with the tip of your finger – the screen responds intelligently and sensitively to your touch. Advanced speech recognition technology lets you control your TomTom GO LIVE Camper and Caravan using voice commands. From planning a route to making a call, over 150 tasks are easily activated by voice, making your drive smoother and safer. TomTom GO LIVE Camper and Caravan mounts on the inside of your vehicles windscreen using the suction cup windscreen bracket provided. TomTom GO LIVE Camper and Caravan can be powered directly either from its internal battery (for up to 2 hours) if it's fully charged or powered from the cigarette lighter socket. The TomTom GO LIVE Camper and Caravan sat nav comes with the latest and most complete maps of Western and Central Europe. Door-to-door accurate navigation anywhere across the continent. Which in addition to street information include features such as route calculation, Points of Interest, Estimated Time of Arrival, and TomTom Map Share technology. TomTom’s unique Map Share technology enhances your navigation experience, because you can now make instant changes directly on your map. TomTom Map Share technology allows you to make corrections to your own map and benefit from thousands of corrections made by TomTom users every day - free of charge. Start driving with the latest map - guaranteed! If a new map for your device is available within 90 days of first use, you can download that map once for free via tomtom.com, please note you are only entitled to one free map download. Due to the continuous improvements in our map quality, some new maps may not fit on your device. In these cases, detailed Map Zones are offered for download. You can only use one Map Zone on your device at a time but it's easy and free to change to another zone at any time using tomtom.com. For more information check www.tomtom.com/mapzones. Looking for genuine accessories and spares for the TomTom GO LIVE Camper and Caravan? All parts are genuine TomTom product and specifically designed for use with the GO LIVE Camper and Caravan sat nav. Accessories available to purchase include a travel case and a beanbag dashboard mount.